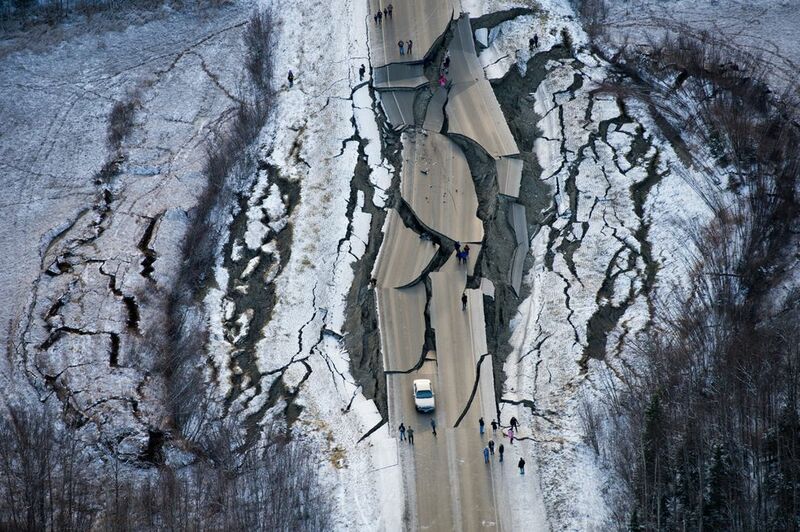 The Alaska earthquake is your story. Thanks for helping us tell it. I was sitting in a Midtown Anchorage coffee shop that Friday morning when the ground jolted — suddenly, violently, loudly. It was 8:29 a.m., and there was nothing subtle about it. The whole place was shaking, and it didn’t stop. People calmly made their way to the door, cellphones in hand, out onto the chilly sidewalk and parking lot. Then it stopped. We exhaled. Pretty much everyone was on their phone, talking or texting. When I stepped back inside, the overhead lights were still swaying. Plaster was on the floor. Coffee had splashed all over the tables. Then the first aftershock hit. 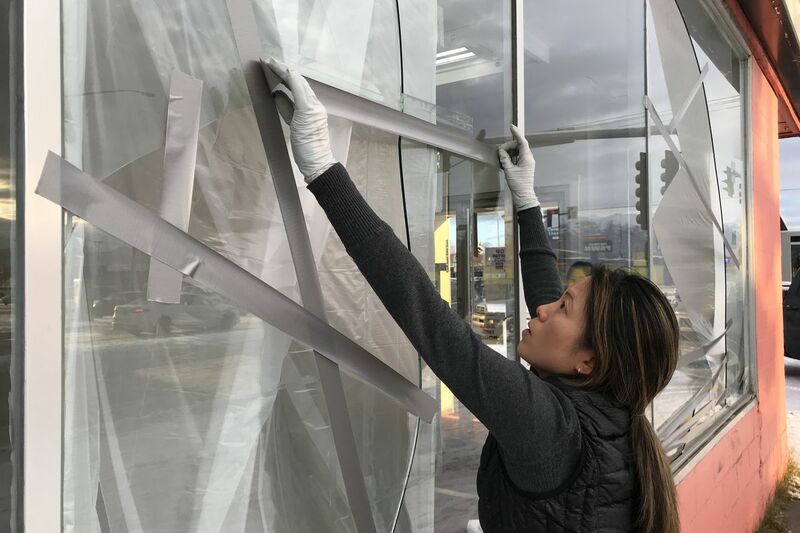 Across Southcentral Alaska, crazy things were happening everywhere: Dishes launched off shelves and out of kitchen cabinets; jars and bottles crashed onto store floors; windows shattered; cracks spidered across walls and ceilings. And worse: In some places, the ground cracked open. Water pipes broke and spewed. A few stretches of roads and highways collapsed and buckled. Buildings were jarred and jolted, and in some cases were badly damaged. People hid under desks, scrambled outdoors, looked after each other. Then they started cleaning up. We’ve been telling these stories for the past week. No one died. Basic infrastructure pretty much held together. A week later, and after hundreds of aftershocks, the extent of the damage is still being tallied. We always experience a fair number of earthquakes in this part of Alaska. Some are little “did-you-feel-that?” rumbles; some are more substantial, and make us think of what’s possible. Social media always erupts when the earth shakes, but the news stories usually have a line that goes something like: ”There were no immediate reports of injuries or serious damage.” This time was different. There were injuries. And damage, a lot of it, and some of it substantial. But in the week since the 7.0 earthquake hit on Nov. 30, the thing we’ve all heard again and again, the thing we’ve been telling each other, is that it could have been so much worse. We have a lot to be thankful for. For us here, the earthquake coverage started immediately, and a week later hasn’t stopped. People on our newsroom staff were like the rest of the community when it hit: We were in the middle of our morning routines, on our way to work, getting kids off to school, settling in at our desks. Our morning news crew had been up and running for hours, and when the quake hit, the team instantaneously expanded. The telecommunications and power infrastructure was pretty much intact here, including internet and cell coverage, so people began working wherever they were - talking with others, getting a sense of what was happening, moving around, writing stories, making pictures, listening. We chartered a plane to see and photograph what was happening from the air. We flew our drone to make photos. One of the pictures from the plane, of torn-up Vine Road out in the Valley, became an iconic image of the earthquake and circulated around the world. People here were dealing with their own stresses and uncertainties - loved ones to check on, kids to pick up, homes to check, messes to clean. We juggled, tried to build a lot of flex into our work schedules, and still covered a lot of ground. We talked to many people in many places. And it continued all week. Over the past week, we’ve published dozens of articles about the earthquake and aftermath, and they’ll continue as the story evolves. Everyone who experienced last Friday morning in Southcentral has a story to tell. We’ve tried to tell many of them and to be a clearinghouse for information: Timely, useful, informative and, we hope, compelling. Since the moment the earthquake hit, readership on all our platforms has been high. Last Sunday’s newspaper sold out. Which brings me to this: If you care about local news in Anchorage and Alaska — and especially if you’re consuming our content regularly — you really should subscribe. It’s not expensive and it helps power local journalism in your community. From the get-go, we asked readers for input, and we’ve heard from a lot of you with questions, suggestions, support, ideas for making the coverage better. You shared your stories, your photos, your videos. What we do is always a two-way conversation. We’ve incorporated many of your ideas into our coverage. Keep passing along your tips and questions, and let us know how we can be useful. We’ll keep telling Alaska’s story, providing news and information, digging in and explaining why things are the way they are, and how they might improve. Here’s wishing everyone well. As always, thanks for reading and thanks for subscribing. To submit an opinion piece for consideration, email commentary(at)adn.com. Send submissions shorter than 200 words to letters@adn.com or click here to submit via any web browser. Read our full guidelines for letters and commentaries here. David Hulen is editor of the Anchorage Daily News and adn.com. He's a longtime editor at the ADN and Alaska Dispatch News. As a reporter, he traveled extensively throughout Alaska. He was a writer on the Pulitzer Prize winning "People In Peril" series and was among the first reporters on scene of the Exxon Valdez oil spill.